Royal DSM, the global Life Sciences and Materials Sciences company, announces the use of Stanyl® ForTii™ in a breakthrough LED array holder. DSM developed a special grade of its high performance polyamide 4T, for the one of the first ever integrated plastics holder for a LED array. LEDs are setting designers free to create new concepts in lighting. LED Array Holders simplify the LED installation process and reduce installation time due to compression contacts that eliminate hand soldering. The holders allow customers to install LED arrays quickly into fixtures. 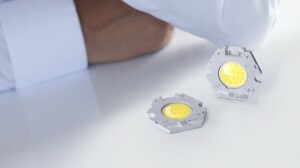 The LED array holder is produced by one of the world’s top suppliers of connectors and interconnect components. Producers and marketers of LED luminaires and fixtures want an aesthetical and white product. The reflectivity of the white LED holder also contributes to the light output of the light unit. Luminaire makers also require a solution where the holder does not crack during assembly into the fixture. The producers of the LED array holders developed a solution that will allow them to reflow solder the array into the holder in a simply and reliable way. This all together requires engineering plastics with excellent mechanical, optical and thermal performance. DSM’s Stanyl ForTii F11C outperforms a liquid crystal polymer (LCP), originally considered for this application, in several aspects. It has high impact strength and its very good flow properties enable it to fill a mold originally designed for an LCP. With Stanyl ForTii you can produce parts with higher weld line strength, resulting in significant less cracking during assembling. Its high deflection temperature under load (305°C), required to minimize distortion during reflow soldering, is better than that of other rival thermoplastics such as polyphthalamide (PPA) and LCP’s. It has a UL94 V-0 flammability rating, and this special version developed by DSM for LED array holders also has the white color and reflectivity required. With Stanyl ForTii, DSM is helping its customers bring to market an easy to assemble, halogen free lower-cost LED. In summary, Stanyl ForTii helps LED lighting producers lower their costs and improve reliability.